After reading the new Oor magazine who wrote James Bay straight into heaven, I decided to give this single/EP a chance myself. I had heard the song before on the radio I think, as it sounded faintly familiar. Hearing it on Spotify, my first impression was "Ha, another Hozier". Not so strange as 'Hold back the river' has some 'Take me to church' overtones. Who cares, as I'm liking what is presented by James Bay. There are enough differences as well. James Bay is not a copy cat piggybacking on Hozier's success, although there's no denying that the success of 'Take me to church' helps. James Bay is a young Englishman of 23 years. 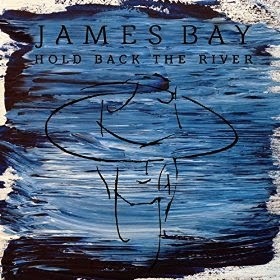 'Hold back the river' is his third single/EP and I even just found out that it has charted in this country. Singer/songwriters are becoming more and more popular in NL, also thanks to 3FM dj Giel Beelen, who tirelessly pushes singer/songwriters. The answer to anonymous dance artists? Who'll say. Fact is that these singer/songwriters mostly sing about personal things, seldom of topics that go beyond themselves it seems. A distinctive quality is James Bay's voice. A strong, soulful voice that leads the pack on Hold back the river. This becomes clear as there are two James Bay's on this EP. One with a band behind him and one that is (more or less) solo. The first two songs are band songs with full arrangements, the second solo performances (with an electric guitar added) and a live version of the single. In both he really convinces. Voice, song and composition. 'Hold back the river' builds up from the solo James Bay to a full song powerfully thrust forward by the drums and piano. A song that holds promise and strength all in one. 'Sparks' has that same electric guitar sound of notes and chords played higher up on the neck. It is also a song in a vain that sounds faintly familiar, although I can't name the singers for sure as they are not up my alley. 'Wait in line' is more singer-songwriter and a strong song. I won't mind to hear a few more like these from James Bay. On the brink of folk, pop and singer-songwriter James Bay presents his songs in a way that make me look forward to his debut album straight away. 'Chaos and the calm' is not released before 23 March, so still six weeks off. A long wait it may, but I can not imagine it to be not worth it.